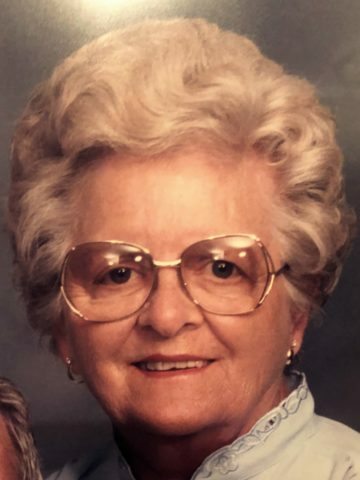 Marian Bloodworth Schablik, age 94, passed away Sunday, January 20, 2019. She was a member of First Baptist Church, in Goodlettsville. Marian graduated from Nursing school in 1969 and worked as a nurse at Tennessee Christian Medical Center. She was preceded in death by her parents, Harvey Lee and Olevia Shannon and husbands, Albert Elvis Bloodworth and John Schablik. She is survived by her son, Danny Bloodworth (Carol); daughter Claudia Davis (Tommy); grandchildren Brian Bloodworth, Brice Bloodworth (Robin), Clint Davis (Leigh Ann), Casey Davis (Ashley); Great Grandchildren, Ellie, Lily, and Molly Bloodworth, Cole, Charlie, Anna Lee and Briar Davis; Step Children, Johnny Schablik (Trudy), Janie Keith (Ted), and Jay Schablik (Debbie). Visitation with the family will be Wednesday, January 23, 2019, from 11 a.m. until the service time. Funeral service will be at 1 p.m. Wednesday at the Cole & Garrett Chapel with Bob West and Bro. Lyle Larson officiating. Pallbearers will be family. Interment, Forest Lawn Memorial Gardens. Our thoughts and prayers are with you Claudia and all the family. Always enjoyed our visits with Mrs. Marian, she was a very interesting person; always informed and always up to date;great sense of humor. Our sympathy to the family. Dear Dan and Claudia, So sorry to hear about your Mom. Just want you to know I’m thinking of you and praying for your family. I will miss our lifelong conversations, visits and shared memories with my special aunt. My love, thoughts and prayers are with the family.